Since its inception in 2002, The TK Foundation has awarded over $46 million in grants to non-profit organizations and projects to improve the maritime realm and the lives of disadvantaged youth. Through a Request for Proposal (RFP) process, we cultivate specific projects and partner with organizations whose efforts are aligned with our program priorities and the requirements of the RFP. This proactive approach helps us maximize effectiveness and impact. The Foundation does not encourage unsolicited proposals for funding within an area of focus where there is an existing RFP in process. Additional requirements may apply to specific grant opportunities — please refer to the RFP documentation for each of our current grants to learn more. To learn more about the TK Foundation’s maritime grant availability, click here. To learn more about the TK Foundation’s youth development grant availability, click here. 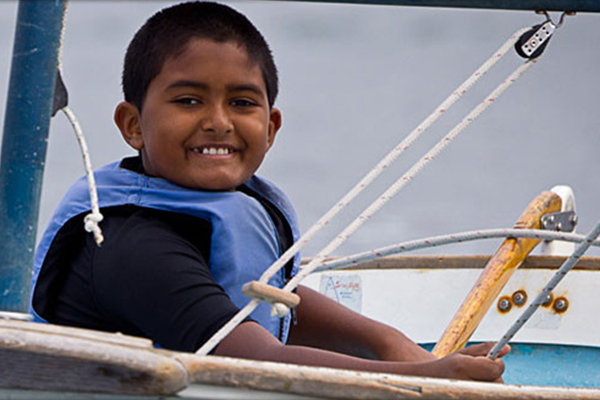 The TK Foundation supports nonprofit youth sailing programs that are reaching motivated disadvantaged youth and offer youth an up-close and personal relationship with the ocean, provide them with opportunities to challenge themselves in an ocean environment, teach responsible seamanship and stewardship, and help them develop important life skills. This grant program is available once a year. The guidelines are now available and applications are due February 15, 2019. If you have any questions or would like to download the application, please contact Austin Muckenthaler at amuckenthaler@oc-cf.org or (949) 553-4202 ext. 248.